It has been a busy couple of weeks. In my last practice in Florida, I pulled a hip flexor. I still traveled to Boston in an attempt to run at Indoor Nationals. After seeing my Chiropractic Consultant in NH, Dr. Brian Bigelow, he taped my injured areas with kinesiology tape, an amazing tool (see photo), and said to give it a shot. I ran a couple of laps, but felt the hip was tearing more so I stepped off the track. It was the right move as I have a big event to prepare for starting with our heavy training in May. I have not had many injuries in my life. It is tough to get me to slow down, but I will let things mend over the next couple of weeks. 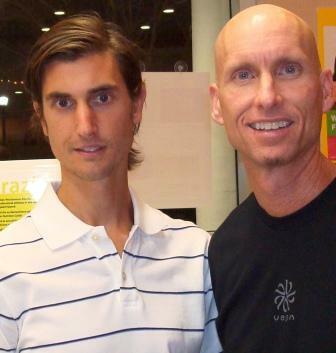 On my return to Florida, Brendan Brazier, who formulated the vegan products that I use everyday called Vega, was in Sarasota speaking about his new book, Thrive Fitness. I am sponsored by Vega and appreciate Brendan’s work in creating great products for all of us to benefit from in our nutritional intake. The Vega Optimizer is a complete whole food meal replacement made exclusively from natural, plant-based ingredients, Vega is an ideal meal for people on the go, providing high quality convenient nutrition without compromises. Vega features 25g of complete protein, essential fatty acids, fibre, vitamins, minerals, antioxidants, probiotics, enzymes and a full dose of ChlorEssence and MacaSure in every serving. I had three talks scheduled after the race in New England on my new book, Creating Amazement. I had the chance to speak to 1000 kids at my old middle school in NH on the topic of short-term and long-term goal setting. It was a great experience sharing our message. There are more master athletes today than at any time since the running boom of the 1970’s. Enter any race whether it is the local 5k or a sprint or Olympic distance triathlon and you will find by far the largest segment of athletes is in the master or over 40 category. This is true for bike races as well. I know this first hand as I lined up this past Sunday for a mountain bike race in the 50+ (sport master) category and there were 21 racers. These athletes are just slightly past their competitive athletic peaks, but are still pushing their own personal limits. As the body starts to lose some of it’s strength, flexibility and aerobic capacity these athletes must do everything they can to maintain their competitiveness. They need to lift weights to maintain strength, continue with anaerobic intervals and tempo runs for endurance and speed and they need chiropractic care to keep their neuromusculoskeletal systems firing properly and their biomechanics in good working order. Treatments can include spinal and extremity adjustment/manipulation, muscle work (pnf stretches to strain counter strain techniques), low level light (laser) to stimulate healing and activate muscle fibers, kinesiotaping to help with strained muscles to name just a few. Take for example the US Postal Service professional bicycle racing team who won the Tour de France seven times in a row from 1999 to 2005. They had a team chiropractor who kept them riding everyday of the grinding 3 week tour and many times the team was the only one of over twenty teams to finish with all nine members still riding (all this through crashes and the overuse injuries that arise in such a grueling event). The riders all gave great credit to the team chiropractor for “keeping them in the game”. Another example is football champion and all-star Jerry Rice who says chiropractic was an integral part of his long and fruitful playing career. So much so that he is now a professional spokesperson for the American Chiropractic Association. Basically speaking, chiropractic adjustments have profound effects on the human nervous system and this is the system that controls and coordinates every function of the human being. What could be more important? Especially for a master athlete. You are much better off and safer with chiropractic care, especially the master athlete.